I have already described the first leg of my return bus trip from Keng Tong to Tachileik where we passed the wrecked Air Con bus. But this journey had other notable encounters in store for us – apart from the rendezvous with the ghost. 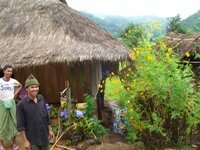 Our bus crossed a terrain of valleys, streams, ravines, jungle-covered hills, banana groves; we passed straw huts, small black pigs, and terraced rice fields. Rounding one corner, I looked up the road ahead of our bus and far in the distance I made out a group of people walking down the road towards us. I suspected they might be soldiers – something about the way they walked; also that they carried long objects. 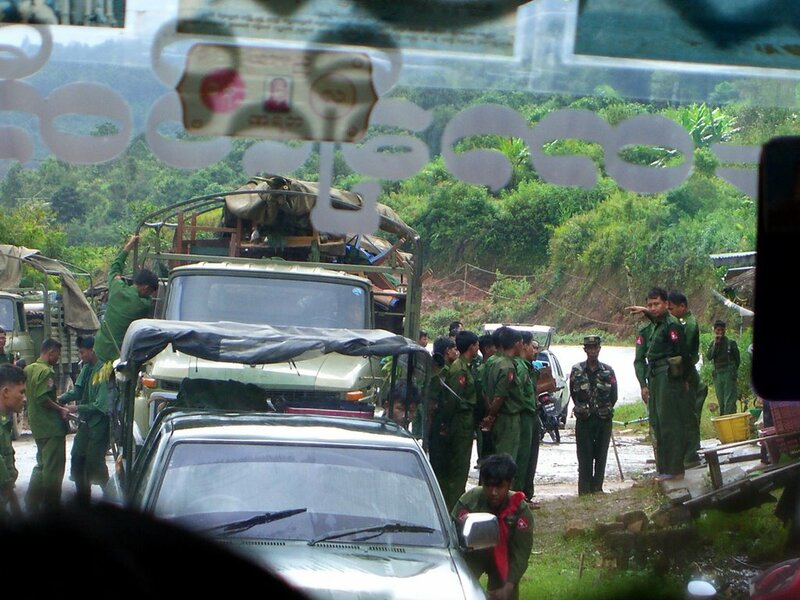 Indeed, we were about to pass an infantry battalion of the Myanmar army – presumably it was on the move against the insurgency which is known to be active in Shan State. Our bus passed several hundred soldiers in all: many carried heavy machine guns, others mortars or grenade launchers on their shoulders. On foot, apart from the big machine guns or mortars they slogged, the soldiers traveled light -- no heavy packs, just ammo belts around the waist. Then our bus came to a stop for a few minutes. Military trucks blocked the road opposite some roadside stores – presumably the commanders were loading up on supplies (see top photo). Later we passed more trucks carrying soldiers, tents, poles, other camping equipment, but little else. No tanks, helicopters, jeeps, or other modern vehicles of war -- just old trucks. Strategy and tactics likewise remain relatively unchanged from decades ago. The guiding strategy is still the so-called "four cuts", which seeks to deprive armed resistance of food, funds, intelligence and recruits by separating them from civilian support. The army implements this strategy by targeting villagers, razing their jungle communities and forcing them out of the hills and mountains. The SPDC has notably shown very little inclination to dedicate resources toward winning the "hearts and minds" of ethnic civilians. Recent reports from the Free Burma Rangers and the Karen Human Rights Group indicate that army columns have been conducting sweeps of KNU-controlled territory, shooting villagers on sight and destroying their food supplies and crops. 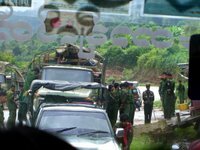 True to form, the great majority of casualties inflicted by the army's current year-long operations have been Karen civilians, providing yet further fuel to the fire of Myanmar's long war.